Loving the opportunity pattern testing gives to discover new designers and their amazing patterns. When Clover & Violet put the call out recently, I couldn't resist - bags using patchwork - what's not to love when I can combine my love of sewing, bags & patchwork? We had the opportunity to select which bag we'd like to test and whilst I would have been happy to test ANY of the wonderful designs, I couldn't go past the Isabella bag (my mum's middle name). The Isabella is a fully reversible bag - thinking that will be quite handy when travelling to match to various outfits or colour ways. One bag, two looks - how good is that. It has 3 external pockets and the 3 internal pockets have elastic at the top to help contain their contents. The bag is approximately 12" wide by 13" high and with boxed corners about 4 1/2" across. It is really roomy and the handle length means it sits comfortably against your side and has a button closing at the top. When pattern testing, I like to follow the first pattern exactly as written to assist the designers with their instructions so was very glad I could get my hands on the exact interfacing needed. I really like the combined effect of using an interfacing and flannel (flannelette) for the quilted areas. The instructions are clearly set out, showing exact requirements and measurements. There are lots of clear photos to assist you through the step by step construction. 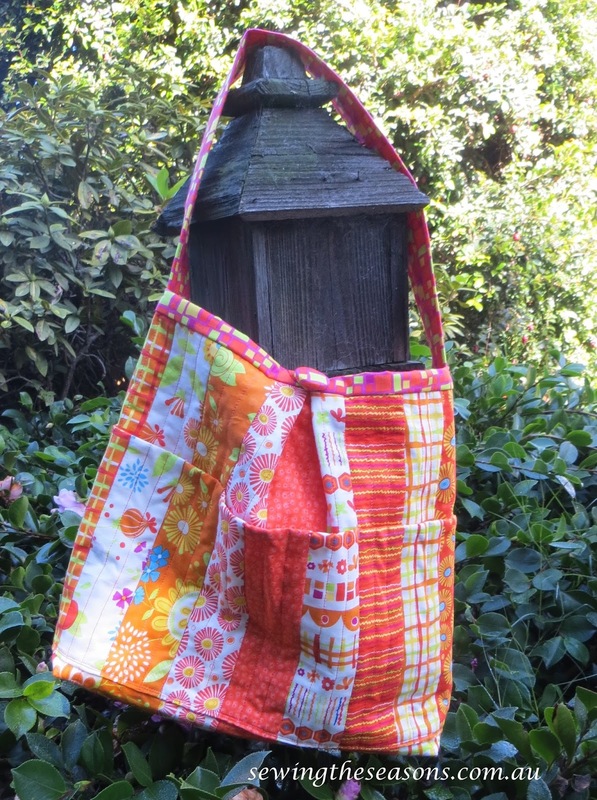 The bag also has two other fabric options for construction using one fabric piece or a set of fat quarters. For this pattern I just knew I had to use the Snap Pop range by Sandy Gervais I had been hoarding for that 'special project'- so bright and cheerful. 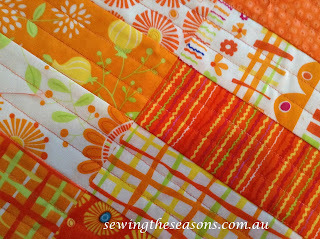 For my second bag, I simply altered the quilting lines, using a serpentine stitch down the seams rather than the rows of stitching as per my orange version and the pattern. 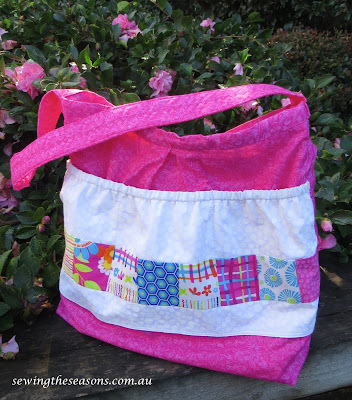 For the lining on this one, I used the narrow strip left from the outer bag, adding a self patterned white fabric to sew a contrast pocket - loving the look against the strong pink of the lining. I also realised I didn't have any self covered buttons left as per the orange bag and instructions, so picked out two pretty flower shaped ones and sewed them onto the bag over a darning needle to give me a button shank - using button hole stitch to finish off neatly. The only change I made was to stitch the two layers of flannel together before threading them through the handle, probably not necessary but I found this a helpful step. 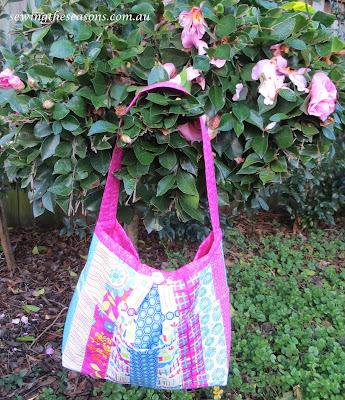 The bag went together so quickly and easily, the longest step was the quilted lines but well worth the time given the finished effect. Oh and you must go and check out their blog, not only are there many helpful hints, but there are heaps (I mean HEAPS) of free patterns and tutorials to try and lots of inspiring projects.